Please join us in celebrating New Urban Arts being named a Coming Up Taller Award winner with an opening event and exhibition of artwork created by New Urban Arts Artist Mentors and Arts Mentoring Fellows. The Coming Up Taller Award is the nation's highest honor for the field of out-of-school time arts and humanities programs. The honor is presented by First Lady Michelle Obama at the White House, on behalf of the President's Committee on the Arts and the Humanities. *Special visit from New Urban Arts Founder, Tyler Denmead. *Great art, good friends and an exciting occasion for celebration!! Tyler Denmead (New Urban Arts' founder) is taking a break from his studies and research and visiting us from England this week to help us celebrate Coming Up Taller! Open Studio with Tyler. Tyler will be hanging at the studio. Drop by when you can and say hi! Happy Hour. Appetizers on New Urban Arts. Drinks on your own. 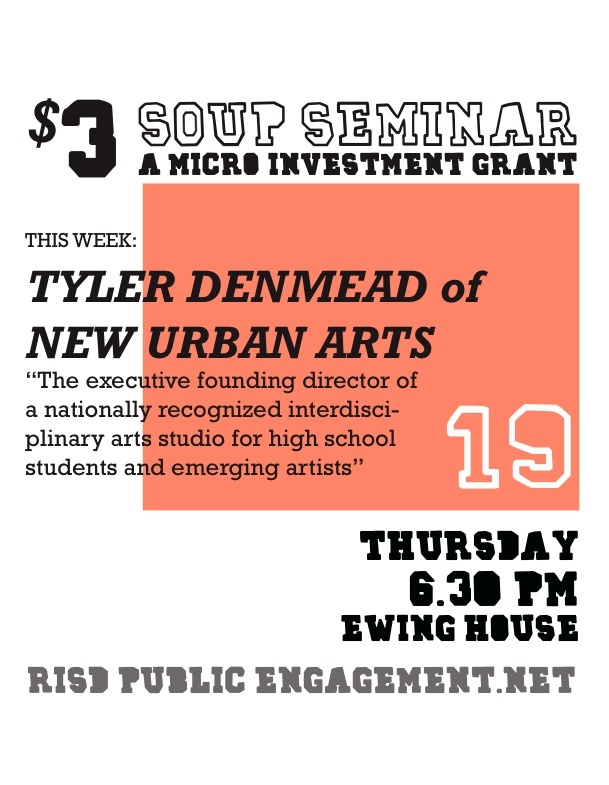 RISD Soup Seminar. 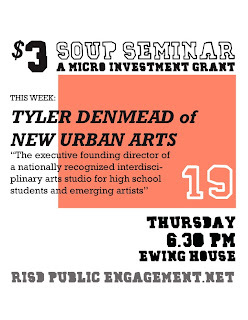 Tyler is speaking at a RISD seminar hosted by Pete Hocking. $3 suggested donation for members of public. Coming Up Taller Celebration and Mentor Exhibition Opening! Pizza party for New Urban Arts alumni and Tyler! You are all welcome to come but this is especially a special invitation to any New Urban Arts mentor or youth alums who may be visiting for the weekend. I will be in New York City on Thursday evening to speak at NYU Wagner's Fall 2009 Panel on Careers in Arts & Culture (Wagner is where I went to graduate school). The other panelists are Kenita Lloyd (MPA ‘09), Deputy Director for the Museum for African Art, and Mark Rossier, Director of Development and Marketing for the New York Foundation for the Arts. The Panel is scheduled for Thursday, November 12, 2009 from 5:30pm to 7:00pm at the Puck Building’s Mulberry Conference Room [295 Lafayette St, 3rd Fl., New York, NY 10012]. This event is open to the public so please spread the word to anyone you think might be interested in this. Or feel free to check it out if you're interested. 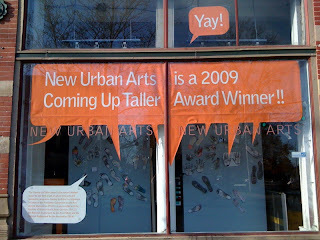 One of the big jokes at New Urban Arts leading up to all of this Coming Up Taller madness was that I wouldn't cry. I have the reputation for not being a crier here in a studio community where people can be sometimes be pretty visibly emotional. First of all, I want to say, me not being a crier isn't some macho, I'm-a-tough-guy-that-doesn't-cry bullcrap, I just happen to not cry a lot. I do get really emotional and I'm as big a softy as anyone else. So a very unofficial bet was on to see what would get me to finally cry in this last very intense and emotional week. Sarah and I got back last night from the Artography conference last night (which itself merits a whole other blog entry once I get my head around it all) and we had a board meeting this morning. Sarah and I summed up the last seven days for the board and Sarah described the party at New Urban Arts on November 4th the day of the ceremony. We did a live video feed from DC into the studio. 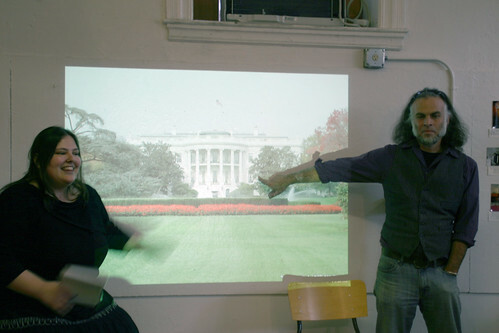 They started by showing a picture of the White House and explaining where Rosalia and I were and what a big deal it was, being invited to the White House on behalf of New Urban Arts. 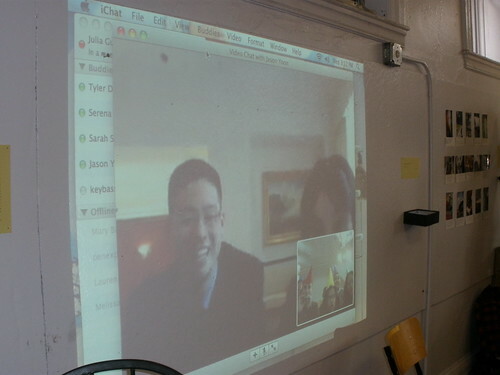 Then, they had to hang up on us because live from England, on the other line, was Tyler! 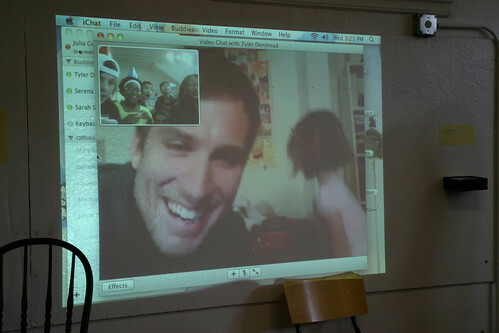 A lot of the students in the room were pretty new and many of them had actually never met him and only had a passing understanding of who he is. 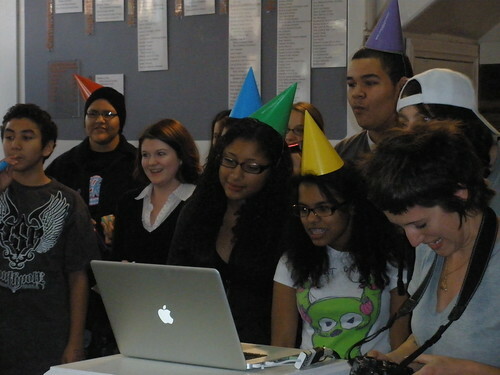 So, as a way of introduction, before Tyler showed up on the screen, Peter asked the artist mentors and the students at New Urban Arts to raise their hands based on their age. "Raise your hands if you're 14, if you're 15, 21...etc." "If you're 14, when you were 2 years old, Tyler was thinking of you." "If you're 21, when Tyler was 21, he was thinking about starting this place." "THANKS FOR THINKING OF US TYLER!!!!" And I couldn't hold it back anymore. As Sarah described this last part for the New Urban Arts board, the tears welled up in my eyes, an intense and beautiful week of pride, inspiration and joy just came out and I looked down, took off my glasses and wiped the tears from eyes. Well, I've been asked to reflect a bit on this Coming Up Taller Award, what it might mean, and to offer a bit of historical context. That pretty much sums up my high school experience. Marcus Civin, one of the other founders, helped established this ambivalence toward awards as a part of New Urban Arts' culture. At the end of our first year in 1998, he gave all the artist mentors and participants an `angel award', which was a piece of copy paper stuffed in thrift shop frames. Each award had a quote from Deborah Meier about the importance of the imagination in our efforts to create a less punishingly cruel, and perhaps even slightly just, democracy. Marcus didn't single anybody out with angel awards. He gave them to everybody, even if they only showed up one day. I think he was attempting to collectively recoginise that everybody at New Urban Arts, like angels, might be the lowest forms of being in the celestial hierarchy, but here we are... still creating a divine niche for ourselves. And, divine it is. Then I thought this juggernaut of an award might be dangerous. Perhaps it might encourage some sort of self-congratulatory standing-stillness. In this way, New Urban Arts might become focused on preserving its past --- an award-winning glory-getting past. This self-preservation might pull the place away from what it is and always has been --- a place with a thriving, unpredictable culture that allows young people and artists to come together and make of it what they want, ask their own questions, come up with their own creative responses, and build some lifelong relationships to each other and the place in the process. Without any sense of obligation to an awarded past, then artist mentors and students could still have the ongoing permission to carve out a vision that I never could have anticipated and still, to be honest, don't really understand. This possible dynamic was a big reason why I left New Urban Arts when I did. I felt myself starting to embody some celebrated past and feared that this, or I, might interfere with this ongoing renewal. New Urban Arts has meant and continues to mean too much to me to ever let that happen. But then this picture came out yesterday and really... I mean, come on, people! What do you expect me to do? Just sit here and not sob!!! You know me!!! I'm an emotional wreck when it comes to this stuff. 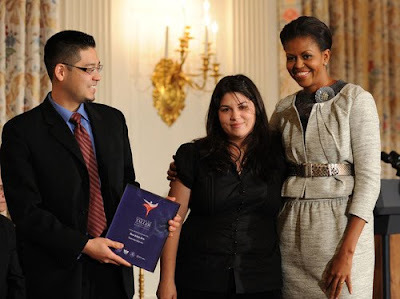 Have you seen this picture of the First Lady and Rosalia embracing, and Jason watching on, holding the award? When I saw it, I just melted and my cynicisms and fears just began to feel, well, a bit sophomoric. Rosalia, like all of us and none of us, has been through a lot. And, I know she has given endlessly to New Urban Arts and to the Obama Campaign. And to see her standing there, dressed up beautifully but still punked out in black... To see her smiling, but still slightly trying not to smile like she does... This was so unbelievably heart-warming and hope-insipring. And, there is Jason, one of the first people to take a risk in becoming an artist mentor at New Urban Arts in its early days, who attempted to make something, anything, out of ether, a couple donated rubber bands, and a dedicated following of students... And now he has taken the risk of being its second Director. And there he is... capturing it all by not looking at the First Lady or the camera. There he is, standing back and looking at Rosalia! I don't know... I guess that says it all. It is just a gift, isn't it? 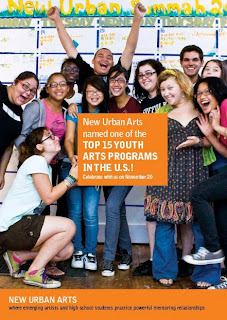 To be able to celebrate Rosalia and all the other young folks and artist mentors at New Urban Arts in this way. They are so unbelievably deserving of this moment. Like Jason, we can just stand back, watch and appreciate the fact that perhaps one of the only adequate ways to honour the spirit, dedication, and creative enquiry of New Urban Arts' students and artist mentors is at the White House with the country's first African-American First Lady. Of course, it has been a long journey from some pretty dark days when trips to the White House were outside the realm of possibility... when giving up --- or locking up --- seemed like the only humane thing to do. And, the fact that the doors still open, attracting endlessly fascinating people to support and participate in creative enquiry New Urban Arts-style, is a wonderful testament to the City of Providence and those who have given so much to the place. I can't wait to thank you in person in a few weeks. The corner of Westminster Street was happenning with our very own celebration including horns, noise makers, party hats, stickers, confetti, cake, and a toast from our Founder, Tyler Denmead, through a live video chat. We even decked out our studio with toilet paper and streamers!! We're extending the celebration with a special event open to the public at New Urban Arts on Friday, November 20 from 4-7pm. Tyler will be flying in from England to be there! Executive Director, Jason Yoon, and Alumni student and Studio Team Advisory Board Chair, Rosalia Velis accepted the Coming Up Taller award today on behalf of New Urban Arts, in a White House ceremony. This prestigious award distinguishes New Urban Arts as one of the top 15 youth arts organizations in the country. Click here to read the words spoken by First Lady Michelle Obama today. The Coming Up Taller Award is the nation's highest honor in the field of out-of-school time arts programs, presented by the President's Committee on the Arts and the Humanities. To find out more about Coming Up Taller click here. We are so humbled - Check out the following links to see who is talking about us! and our favorite coverage, alumni artist mentor: Melissa Mendes! And our dear friends at Community Music Works! The Mall Art Ambush Went Well!! Check out our pictures on Facebook and flicker from the art making workshops on the Washington, D.C. Mall. The Art Ambush team woke up bright and early this morning and we made our way to the National Mall. There we met up with Andrew around 10am and we set up shop in front of the National Gallery! We had several art making workshops going on. We had the "Clothesline for Change...I remember..." where we got people to come and finish the prompt with a memory and then they'd tie the tag to the clothesline. We were also making sumi ink drawings, where you blow the ink onto the paper with a straw. Then with color markers you can continue to add to it and make another image. And we were also making quick art books. The day went really well. We had a good turn out. Lots of were people having their daily jog, lots of students and tourists. We passed out lots of NUA newsletters, Flip zines, and business cards. So what is next on the agenda? We're back at the hotel now, getting ready for tonight. We are off to Capitol Hill at the Senate Visitors' Center to celebrate the Coming Up Taller Award!!! We're going to be having more workshops there at the reception too. 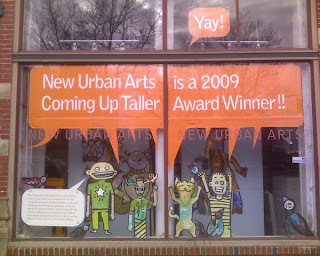 NEW URBAN ARTS IS A 2009 COMING UP TALLER AWARD WINNER!!! First Lady Michelle Obama presents New Urban Arts a Coming Up Taller Award in Washington DC! New Urban Arts is nationally recognized as one of 15 youth arts and humanities programs to receive the prestigious 2009 Coming Up Taller Award. An initiative of the President’s Committee on the Arts and the Humanities, the Coming Up Taller award is the nation’s highest honor for the field of out-of-school time arts and humanities programs. Read more about it here. Follow live updates today from DC on twitter. This is Adrienne here to update you on all the happenings that are going to be going on this week in D.C. 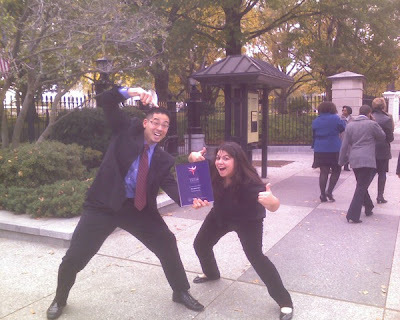 The Art Ambush Team just got into Washington D.C. It was a crazy day of traveling, but we're all here nice and safe. It actually went quite smoothly! Everyone has been keeping in touch with everyone else all throughout the day. Unfortunately the art bus couldn't make it down, but it's all good! Andrew made it home ok, we met up with Tamara, and Jason and Rosalia are all good. Jason and Rosalia saw Edward Norton and Kal Penn during the reception at the Kennedy Center! It was pretty crazy how fast we drove through the city; Maryland to D.C. to Virginia, and within like 20 minutes! haha. We're all having dinner right now and then off to beddy time. On the agenda for tomorrow, we're waking up bright and early and we're going to take the train into the city where we will meet up with Andrew. We'll set up at the mall and let the art making beginning!! !